iHeart is launching in October 2014 and we'd love to give you guys a sneak peak before anyone else. Some are confused as to what the iHeart device is, and how it works. Allow me to explain. 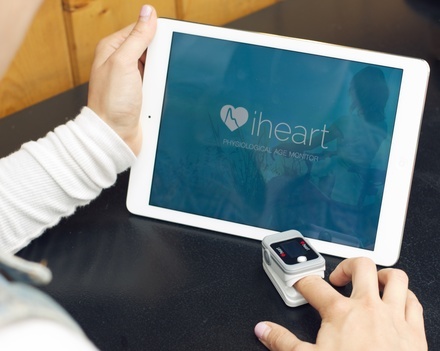 The iHeart device is a revolutionary new motivational tool for health minded individuals and people that want to see how their positive choices are affecting their inner physiology. You don't wear it 24/7, you don't input a ton of information. Test yourself often, make good choices, and see how you are making changes to your inner health. Your results are sent immediately to your own personal website that you can visit to see your trending graphs and every single previous test. iHeart is complimentary to devices like Fitbit, Jawbone Up, and the Nike Fuelband. It shows you how increased movement, improved diet, better sleep and lowered stress are affecting what really matters, your inner physiology. The iHeart team wants to help you get healthier, so we add regular blog posts with fitness, diet, and lifestyle advice from our wonderful ambassadors. 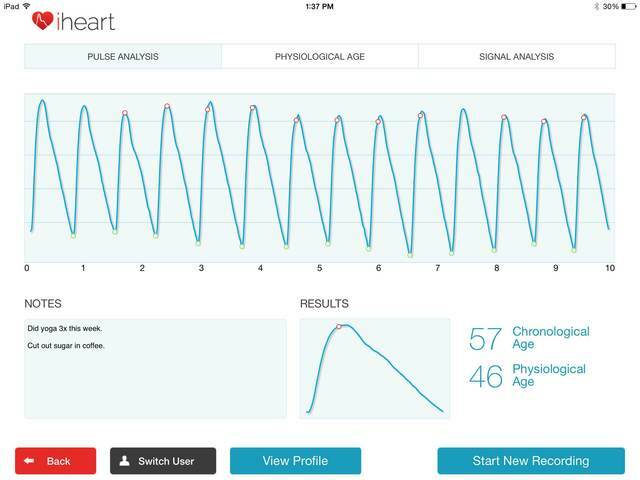 The iHeart device works with the free iHeart Physiological Age app available on iPhone and iPad. It's small and fits on your fingertip, easy to take anywhere you go in your pocket or purse if you want to show it off or test your friends! Let's face it, there's a huge focus on outer appearance, weight, and size as markers of health and wellness. You know what's really important? What's going on inside your body affecting your organs and circulations. When you take positive steps to lower your physiological age with iHeart you will see your physiological age drop with an extra bonus of your outer appearance, stress levels and sleep improving. It's also really interesting to see how stress affects your readings. Your body is very dynamic and being able to create bodily awareness by watching how your body reacts to different stimulus is a great thing. You'll be able to see and feel how your body reacts in a whole different way. It's new and exciting. 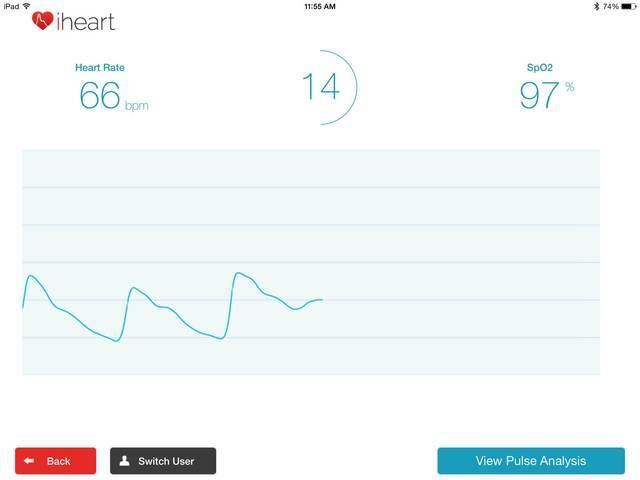 The device is a small fingertip oximeter that connects via bluetooth to your iPad or iPhone. 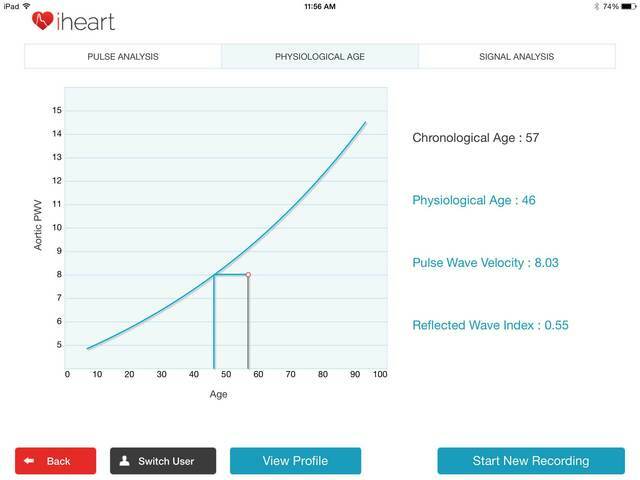 Once signed in to your account, you can begin recording your first physiological age test. Our device is custom built and samples at a very high speed. This is how we can see certain specific points in the pulse shape to determine your level of aortic stiffness and your physiological age. After your 30 second test results are immediately displayed for your review. Input notes to see how different readings correlate to different activities, diet, stress, etc. Review where you stand compared to the general population. After your first recording it's up to you to make positive choices and watch yourself get physiologically younger. Gain bodily awareness by learning how your body reacts to positive and negative stimulus. Take the focus off of outer appearance and start focusing on what really matters, what's going on inside the body. iHeart is a great motivational tool for anyone to use. Pre order now or submit your email to be notified of our launch in October, 2014.